Hello October. This month I will be posting all black and white outfits. So, for my first October B&W outfit I have on a beautiful white lace dress. Added a skinny black belt to the dress to make it a little shorter. 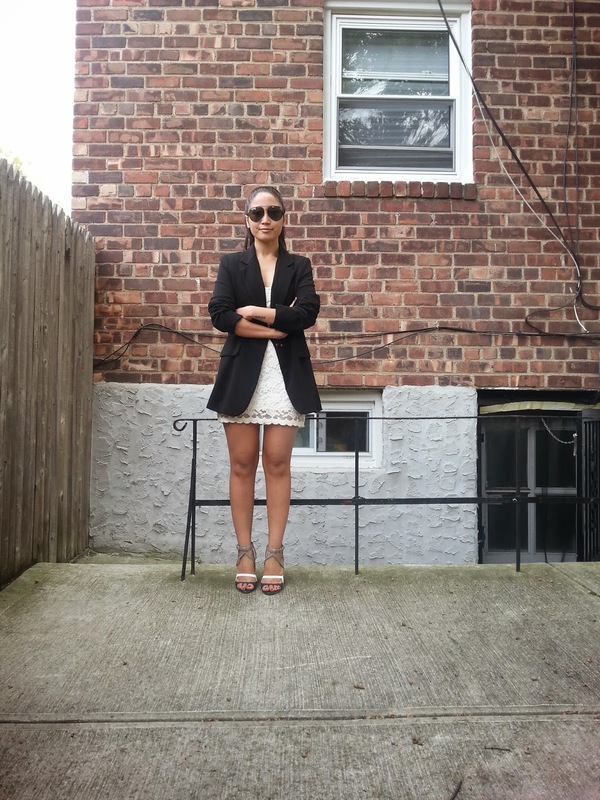 Threw on my favorite black boyfriend blazer over the dress and black and white heels with a hint of grey to complete my ensemble. Such a lovely dress! You look amazing! Love your blazer! I love lace and your dress is amazing!!! You look so cute! I love your shoes! Love the dress and the jacket combo! Gorgeous look! Your look is beautiful. Love your blazer. Looking good. Love the whole outfit! I agree with that quote absolutely. Black and white are my favourites, they are the strongest colors from the whole spectrum. Your look is also pretty good today, it's simple, yet amazingly chic! Such a great post turned out, I enjoyed it very much! as usual you look pretty, love that lace dress! Your look is beautiful! !Love dress!! Hey great post! Keep blogging! I totally agree with the quotes! You look so pretty, I really like your shoes! The perfect black and white look! Amazing! Love the beautiful Blazer ,great Piece! this outfit is absolutely adorable! Very recently I saw something like this dress & loved. but did not buy bcoz of my body type. You look so nice. HI! I WEAR MASCULINE BLAZERS, I LOVE THEM! LOVE THIS LOOK. So simply and chic! Black and white is a classic and elegant combo. and that lace dress is fab. Your lace dress and your sandals are to die for!!!!! !